Pieces are now arriving! Check out Emmi's human alien! The 9x12 show and fundraiser is coming Saturday, May 4th. Get tickets here by clicking the SUPPORT NOW button. Pre-sale tickets are currently $40 each. These are virtual tickets - just check-in at the door. Your admission includes beer, wine and cocktails along with great food and entertainment. You can also claim a 9x12 painting for an additional $100 donation. 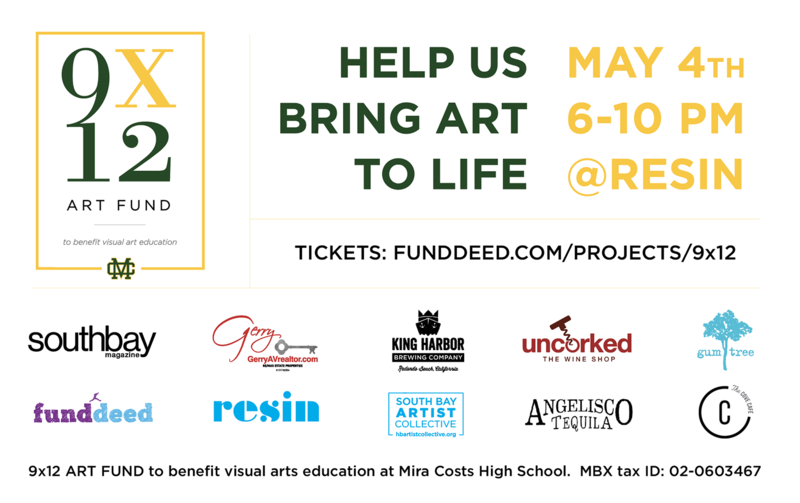 Thank you for supporting our local high school students and visual arts department at Mira Costa! 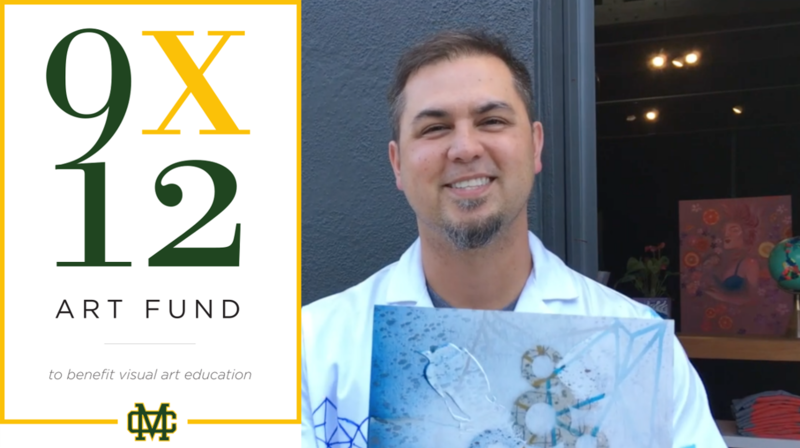 The mission of the Mira Costa High School (MCHS) Visual Art Education Booster club, also called the 9×12 Fund, is to create an effective fundraising group in support of MCHS Visual Art Education. 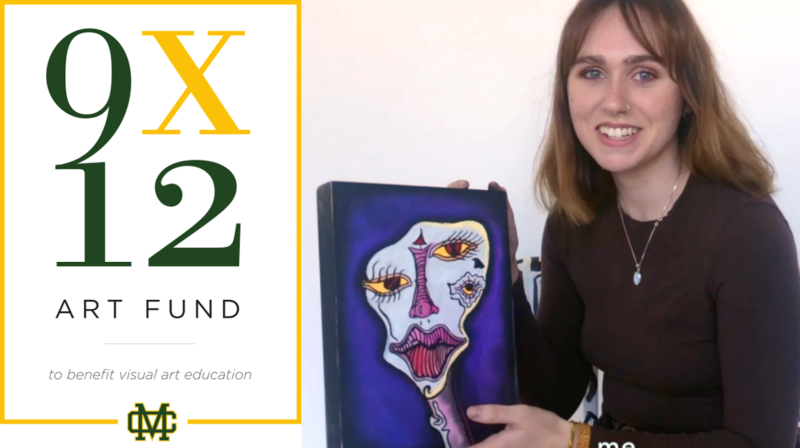 The 9×12 Fund connects students, parents, local businesses, and boosters with opportunities to donate to MCHS Visual Art Education. Core on-going fundraising programs include events, crowdfunding platforms, selling student-made products, local partner programs and sponsorships, and other initiatives. The primary driving principle of the 9×12 Fund is to effectively raise money for MCHS Visual Art Education in ways that are low-impact to the staff, and facilitate opportunities for students to feature their art work and creative overall awareness of the needs and successes of MCHS Visual Art Education and Programs. The 9x12 fundraising event will be Saturday, May 4, 6-10pm at Resin art studios in Hermosa Beach. A limited number of tickets are available for pre-sale now with each donation of $40. You can also donate $100 and get a gift of a one-of-a-kind 9x12 art piece that you'll get to pick out at the show. And there are other sponsorship opportunities available. Just click SUPPORT NOW and select the donation level you would like. The state and local budgets for art at Mira Cost High School (MCHS) is drastically under-subsidized. Without your help, visual art programs at MCHS will end up being left behind, along with all the benefits that art provides for personal and professional development. Art is central to our ability to think creatively and become more innovative in our solutions to problems. Art is more than learning to draw, paint and make things. It is an outlet for expression and a laboratory for creative problem-solving. It helps develop skills and abilities that other fields of learning often overlook. The 9X12 Mira Costa Fund will fill the void left by state and local funding and provide students with supplies, instruction and leadership that will be sustainable for years to come. Please join us and help bring art to life here in the South Bay. Your donations are tax deductible and you will receive an email receipt upon completion of your donation. Emmi is a senior at Mira Costa High School and an aspiring artist. 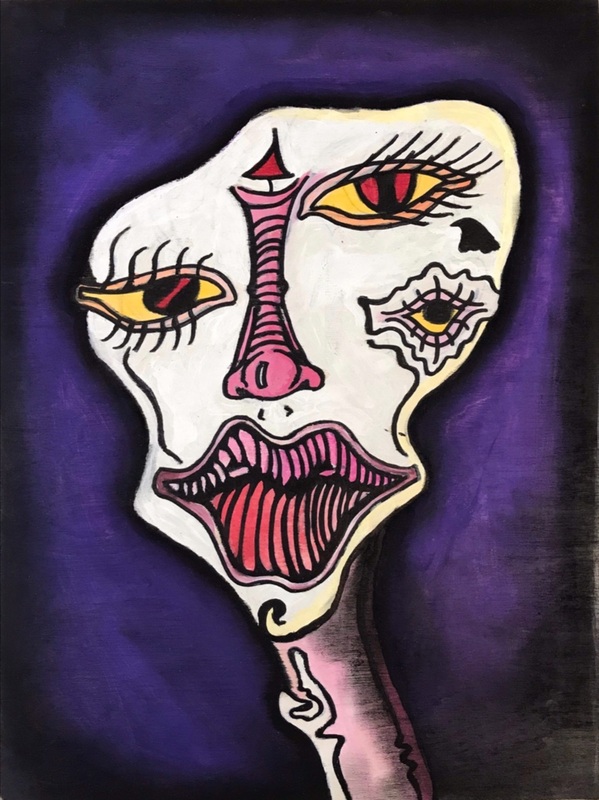 She shares her thoughts about her 9x12 piece that she created for the 9x12 art show and fundraiser for the Mira Costa Visual Arts department on May 4 at Resin in Hermosa, from 6-10pm. Get tickets and reserve a 9x12 now! Just click the buttons below, or go to the 9x12 project page and click the SUPPORT NOW button and select your donation level. All donations go to support the Mira Costa Visual Arts Department, which has been under-funded for some time and desperately needs your help to provide proper supplies and equipment to give these high school students all the benefits of creative problem-solving and personal expression. Thank you for your generous support! Mira Costa High School visual art students and local artists are creating original 9x12 art pieces that will all be taken home by generous donors who give $100 to the Mira Costa visual arts department. You can be the new owner of a one-of-a-kind piece by making your donation now. In addition to your 9x12, you'll want to get a ticket to the show on May 4th so you can peruse all the 9x12 art and select the piece you want to take home. Just click the buttons below, or go to the 9x12 project page and click the SUPPORT NOW button and select your donation level. All donations go to support the Mira Costa Visual Arts Department, which has been under-funded for some time and desperately needs your help to provide proper supplies and equipment to give these high school students all the benefits of creative problem-solving and personal expression. Thank you for your generous support! The 9x12 show and fundraiser is coming Saturday, May 4th. Get tickets here by clicking the SUPPORT NOW button. Pre-sale tickets are currently $40 each. These are virtual tickets - just check-in at the door. Your admission includes beer, wine and cocktails along with great food and entertainment. You can also claim a 9x12 painting for an additional $100 donation. Thank you for supporting our local high school students and visual arts department at Mira Costa! With your donation, you are pre-paid to select a one-of-a-kind 9x12 painting at the show. Note: This donation does not include admission - for a ticket and a painting, select One+One. Admit One plus Pick a 9x12 Painting - includes access for one (1) to the 9x12 show, plus pre-paid to select a one-of-a-kind 9x12 painting at the show. Admit Two plus Pick a 9x12 Painting - includes access for two (2) to the 9x12 show, plus pre-paid to select a one-of-a-kind 9x12 painting at the show. With a donation of $1000 or more, you will join our sponsors at the Platinum level. With a donation of $500 or more, you will join our sponsors at the Gold level. With a donation of $250 or more, you will join our sponsors at the Silver level. To donate any amount, add the amount in the pop-up window. ADMIT ONE - includes access for one (1) to the 9x12 show on May 4 (5-9pm), plus 10 opportunity drawing tickets. A limited number of tickets are available for the show at Resin. These are virtual tickets - just check-in at the door. ADMIT TWO - includes access for two (2) to the 9x12 show on May 4 (5-9pm), plus 20 opportunity drawing tickets. A limited number of tickets are available for the show at Resin. These are virtual tickets - just check-in at the door. PICK A 9x12 PAINTING - With your $100 donation, you get to pick out a one-of-a-kind 9x12 painting at the May 4th event. Just check-in at the door and you will receive your sticker to claim your painting. Admission to the show is additional, so if you want a ticket and painting, select the One+One. ONE + ONE - includes access for one (1) to the 9x12 show on May 4 (5-9pm), plus 10 opportunity drawing tickets. PLUS, you are pre-paid and will get to pick out a one-of-a-kind 9x12 painting at the May 4th event. These are virtual tickets - just check-in at the door. TWO + ONE - includes access for two (2) to the 9x12 show on May 4 (5-9pm), plus 20 opportunity drawing tickets. PLUS, you are pre-paid and will get to pick out one one-of-a-kind 9x12 painting at the May 4th event. These are virtual tickets - just check-in at the door. PLATINUM SPONSOR - With a donation of $1000 or more, you will join our sponsors at the Platinum level. Each Platinum Sponsor will be recognized at the event, and have brand presence at the event. GOLD SPONSOR - With a donation of $500 or more, you will join our sponsors at the Gold level. Each Gold Sponsor will be recognized at the event, and have brand presence at the event. SILVER SPONSOR - With a donation of $250 or more, you will join our sponsors at the Silver level. Each Silver Sponsor will be recognized at the event, and have brand presence at the event. MUSTANG SPONSOR - make a recurring donation of $25 or more per month. Please select the "Recurring Payment" box in the checkout. As a MUSTANG, you have access for two (2) to the 9x12 show on May 4 (5-9pm), plus 20 opportunity drawing tickets. These are virtual tickets - just check-in at the door. DONATE ANY AMOUNT - by putting the amount in the window above.